...that's how long I'm giving me and Ethan to give up the pacifier. I started this process accidentally the week before our vacation. I forgot to give him his paci at nap time and guess what....he didn't care. SWEET! So the next nap time we also went paci-less with a little crying. That's okay, this is new. I still let him have it in the car, while we were out, and for night time sleep. I decided that I'd get rid of it in phases. Before vacation we were napping paci free. I thought I was golden. Then we went on vacation. Of course he had it all the way down there. I gave it to him at nap time because he was in a new location, off schedule, and in a new crib. The paci free nap times were forgotten...until this weekend and I decided it was time to give it up again. It was so easy the last time right? It shouldn't be any different this time. Wrong, wrong, wrong! I thought I'd start back with just going without it at nap times again. There was more crying this go around and every time he saw the paci he'd grab it like it was something he couldn't live without. Somehow I made him MORE attached to the paci. So I decided to try this out...see if I could handle it. We went on a paci free errand trip. To the drugstore, to the grocery store, to the bank. Easy peasy...I'd even accidentally pinched him with the shopping cart cover belt at the grocery store and we recovered with no problems. I had to fight my instinct to instantly shove that paci in his mouth (yeah I brought it just in case...I'm not totally crazy). I had to hide it from myself. You see the thing about pacis is that it's not just the baby that gets attached to it. It's also the parents. It makes things easier. Less crying, more sleep, less public embarrassment. Good for everyone. So I've hidden them from myself. And yeah, I can do that because lets face it...the mommy brain allows me to forget everything like where my keys are, when the last time I showered was, and if I paid the bills...so hiding the paci...no problem. He learned to crawl between vacation and now which makes him 5 thousand times more curious, more mobile, and more challenging. We moved his crib down just in time for him to learn to pull up on the bars. Well guess what.....he doesn't know how to get down. I tried to put lay him back down, paci and all. He was smart enough to retrieve it. I couldn't bring myself to take it away. I have to admit I was sort of impressed. He wouldn't sleep though and he was definitely tired. So I laid down with him in my bed with the tv on so maybe he would at least rest since my husband wasn't getting home until late and we all know what happens after 5......fussy baby chaos time. Rest was needed...for us both. Now for night time sleep. My kid normally goes right to sleep..no problems for the most part. I broke it to my hubby that we were cutting the paci completely. We did the crying routine again. I was exhausted by this point but I know from previous experiences with Ethan that usually 3 days is all it takes to get him used to something and the first day is always the worst. He finally went to sleep...everything seemed good. Around midnight he woke back up and he was NOT happy. I rocked him, turned his seahorse on...let him cry for a few minutes and went back in. 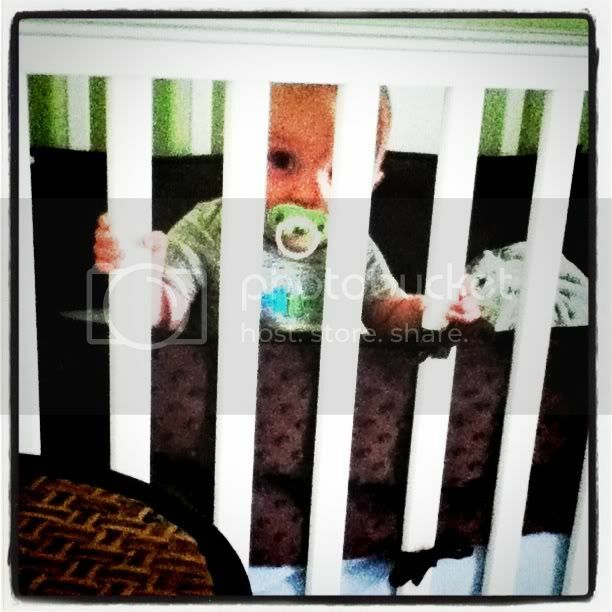 He was STANDING in his crib. Again, he couldn't get back down. We had to start the process again....and again...and again. All I could think was what a terrible mother I was. I'm a mean person. He's just a baby. I should just give it back to him. Enter overworked husband...."why are we doing this again?" "He's only 7 months old Laura" "I thought we were just doing nap times". I left him with Ethan and I went downstairs to pout and take a breather. Michael came back down about 10 minutes later and Ethan was asleep. "You know you just ruined all the process I made today" I said. That's when he told me...he didn't even have a paci in. Miracle worker I tell you. We are an hour into the first morning nap of today and I have a sleeping boy. The first 30 minutes...cry, rock, seahorse, repeat. It was easier though. So, maybe we are making progress. Now, I know everyone has their different opinions on this pacifier topic so let me go ahead and get this out there...I'll respect your decision for your child, please respect my decision for mine. Good for you for trying to break it now. It may seem hard but I bet in the long run it will be easier because he's too young to really know the difference. I'm too chicken to try. Jamie isn't totally hooked, like 24/7...but he definitly prefers it for naps and nighttime. I'm probably going to try after his 1st birthday. Its times like these I'm glad Emeline has zero attachment to a pacifier. Ever. Good luck, momma! you guys can do it! Harlan never used a pacifier. There were plenty of times that I wish she did, but she wouldn't take it! Good luck!!! It took us about 3 days to get rid of it too. I got rid of it for daytime naps and then was planning on working on nighttime sleeping the next week but after one week of no paci naps, she dropped it herself at bedtime. And now, she hasn't used it in months. She still has it in her carseat because she likes to play with it,but doesn't use it as a traditional paci. And how you said "I'm a mean person,he's just a baby" .. that stuff? I have TOTALLY felt like that. So often. I'm trying to wean her off of nursing in the night and I am really struggling with those feelings. She doesn't NEED to be eating at night, but then sometimes I feel like I'm being so mean by not letting her have something that is comforting to her. I, personally, chose not to wean my baby from the paci at 7 months, but I know it's going to happen at some point in time. And remember, there's nothing mean about weaning babies or transitioning them to things that happen as you get older. It's all part of life. It took Jayden three days. But... he was three. I know, I know, bad mommy. With Ian, I'm hoping to do it sooner. Good Luck! Gulp, I dread this!! Good luck! Thanks for stopping by my blog. I'm in love with yours and am a new follower!